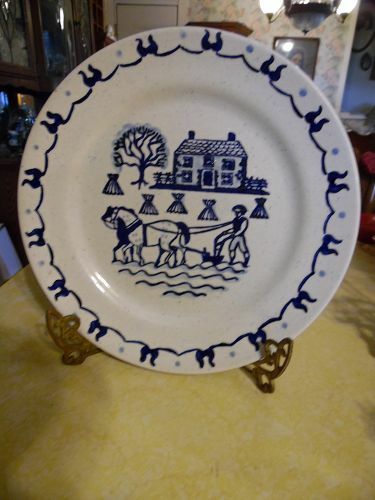 Poppytrail blue provincial dinner plate farm scene 10"
Poppytrail /Metlox a California pottery. Provincial Blue has a farm scene and border design in blue on white. 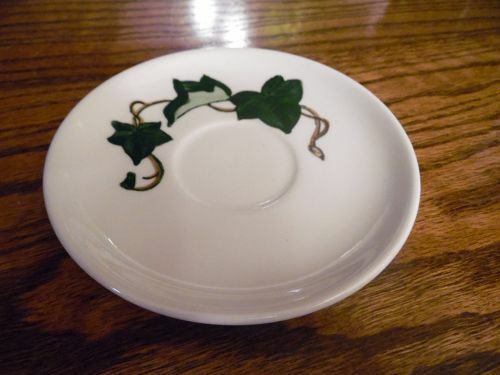 I have 6 available, but price is per plate. 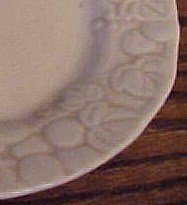 All plates are in superb vintage condition--no chips, cracks, stains, etc. Save on shipping when you buy in quanity. 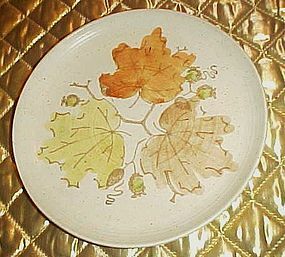 Poppytrail by Metlox 8 1/8" salad plate in the Woodland Gold pattern. Oatmeal background, large hand painted leaves, with coup shape. Perfect condition with no scratches, chips or cracks. I have 2 available in this size/ Pattern introduced in 1959 and was discontinued in 1979. Price is per plate. 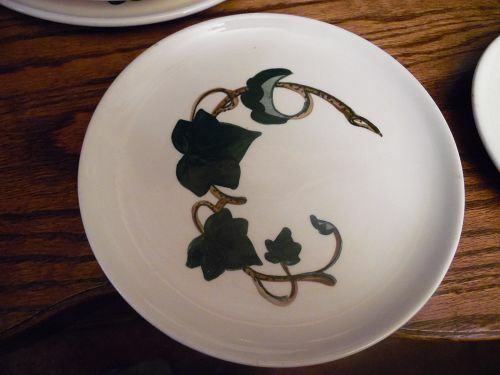 Poppytrail by Metlox 6 3/8" bread and butter plate in the Woodland Gold pattern. 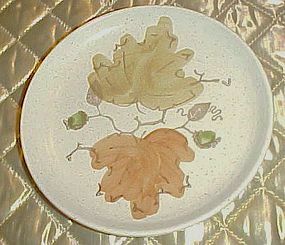 Oatmeal background, large hand painted leaves, with coup shape. Perfect condition with no scratches, chips or cracks. I have 5 available. Price is per plate. 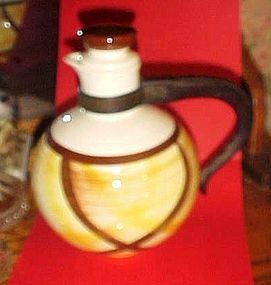 Nice Vernon Kilns Organdie Coffee Pot, Carafe or Pitcher with original lid. 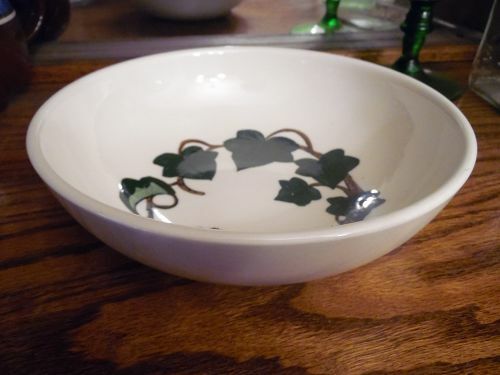 This piece measures approximately 8 1/8” tall with the lid on, 7 ½” wide at its widest point, and the bottom measures 2 ¾” in diameter, it has a bakelite handle and it holds 5 cups of liquid. Overall, this piece is in excellent condition. Pretty yellow and brown hand painted plaid design (Organdie). 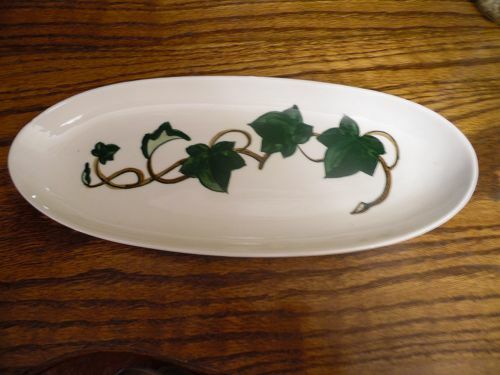 Made by VernonWare a California Pottery. All decoration underglaze. Metlox, Poppytrail, Vernonware. 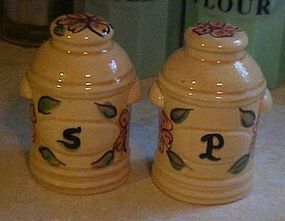 Vintage metlox pottery salt and pepper shakers are a perfect size to keep on your stove. 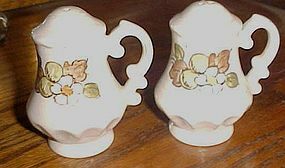 Each marked, S & P. Measures 4 3/4" tall and is hand painted with large flowers and leaves. Original red rubber Metlox stoppers are intact. 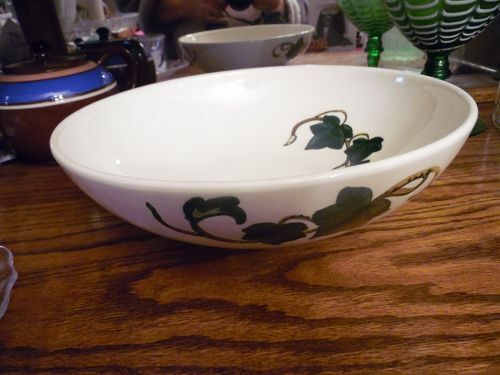 Says Metlox on the bottom though it is filled with glaze and bareley legible. Perfect condition with no chips or cracks. 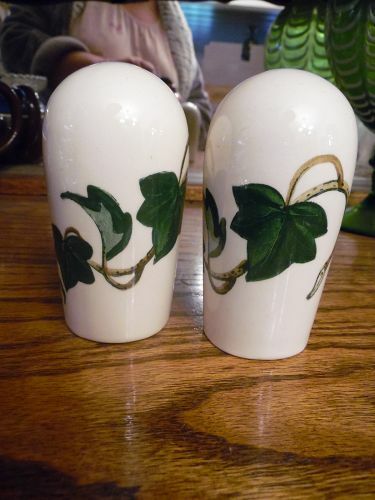 Metlox Poppytrail California Ivy Salt & Pepper Shakers set.California Ivy is a beautiful, timeless, hand painted pattern first produced in 1946. 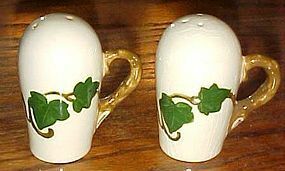 These vintage salt & pepper shakers have hand painted ivy leaves and vine tendrils in rich greens and browns. The handles are brown "twigs". Each shaker is about 3" high, 1-1/4" across the base. No chips, no cracks, or damages. Some crazing onthe 3 hole shaker. Glaze is still glossy & bright, colors unfaded. Clean, ad nice. No stoppers. 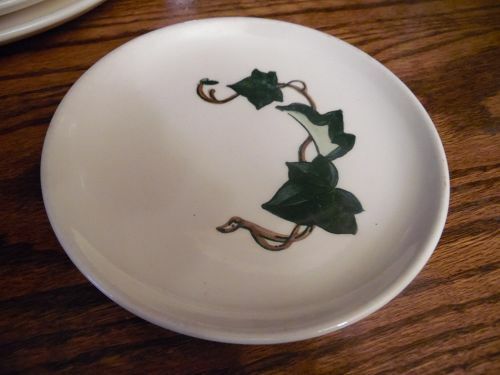 6 1/4" saucer in the antique grape pattern made by Metlox, Poppytrail, Vernonware of California. Made from 1964-1984. 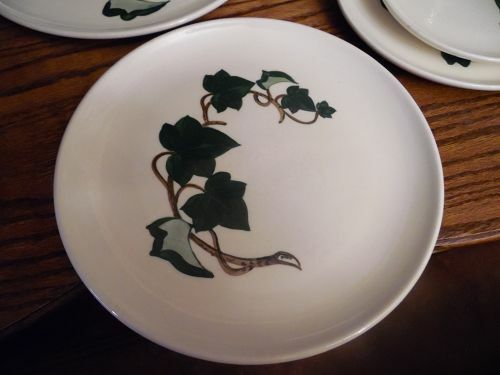 Soft creamy white color with antiqued effect showing off the relief of the grapes and leaves. Measures 6 1/4" in diameter. 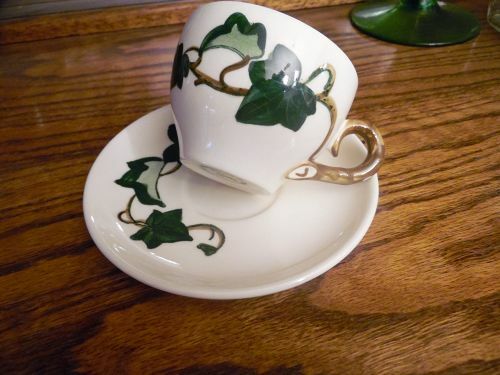 I have 5 available, price is for each saucer. all are very nice with gentle wear. Very similar to Antiqua pattern.